Background: Resection for colon cancer in the elderly is considered as a major undertaking, which is associated with a high operative morbidity. There have been studies on the safety of laparoscopic colectomy in the elderly. 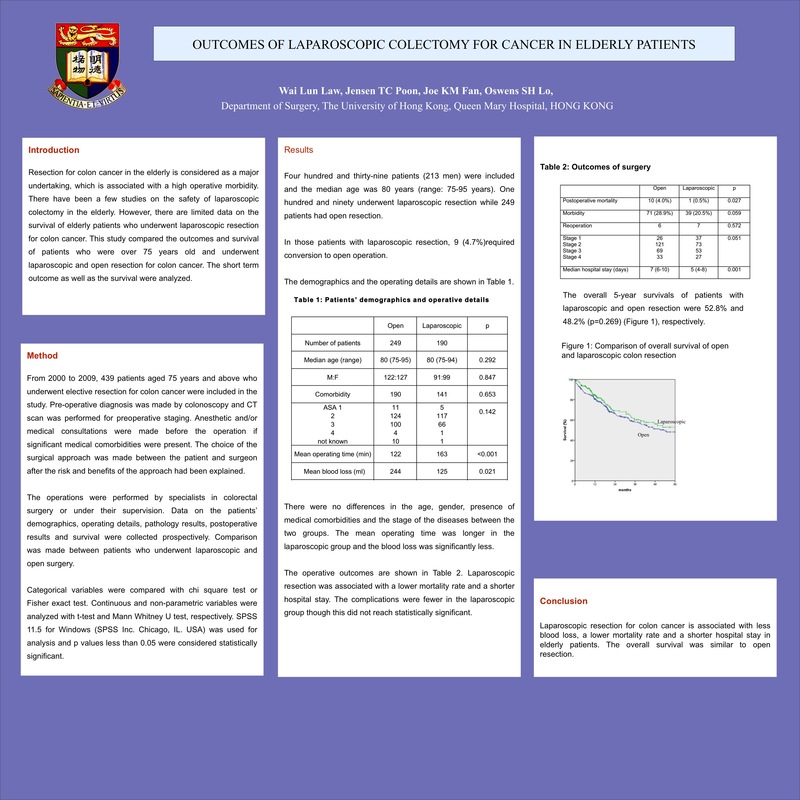 However, there are few data on the survival of elderly patients who underwent laparoscopic resection for colon cancer. This study compared the outcomes and survival of patients who underwent laparoscopic and open resection for colon cancer. Patients and methods: From 2000 to 2009, 439 patients aged 75 years and above who underwent elective resection for colon cancer were included in the study. The operations were performed by specialists in colorectal surgery. Data on the patients’ demographics, operating details, pathology results, postoperative results and survival were collected prospectively. Comparison was made between patients who underwent laparoscopic and open surgery. Results: Four hundred and thirty-nine patients (213 men) were included and the median age was 80 years (range: 75-95 years). One hundred and ninety underwent laparoscopic resection while 249 patients had open resection. In those patients with laparoscopic resection, 9 (4.7%)required conversion. There were no differences in the age, gender, presence of medical comorbidities and the stage of the diseases between the two groups. The mean operating time was long in the laparoscopic group (163 min vs. 122 min, p<0.001) and the blood loss was significantly less (125 ml vs. 244 ml, p=0.021). The 30-day mortality rates in the laparoscopic and open groups were 0.5% and 4.0% (p=0.027) respectively. The postoperative complication rates of laparoscopic and open groups were 20.5% and 28.9%, respectively, (p=0.059). The median hospital stay in the laparoscopic group was 5 days (IQR: 4-8 days), which was significantly shorter than those with open resection (median: 7 days; IQR: 6-10 days) (p=0.001). The overall 5-year survivals of patients with laparoscopic and open resection were 52.8% and 48.2% (p=0.269) (Figure 1), respectively. Conclusions: Laparoscopic resection for colon cancer was associated with less blood loss, a lower mortality rate and a shorter hospital stay in elderly patients. The overall survival was similar to open resection.